Next to Hornfair Park in Charlton an intriguing public garden has been added to the Inventory recently: the former Blue Cross Pet Cemetery restored through the hard work of the Friends of the Pet Cemetery. Its origins date back to the founding of Our Dumb Friends League in May 1897, which opened its Blue Cross Fund during the Balkan War with the initial aim of alleviating the suffering of horses. Although the Blue Cross symbol became known in the field as the emblem for animal medical welfare, it was not until 1950 that the League changed its name to The Blue Cross, now shortened to Blue Cross. Unfortunately the records that might have supplied the early history of the Pet Cemetery were lost in a post-war fire at the Blue Cross. What is known is that in 1897 a private kennel was established at Hope Villas, a large house on Shooters Hill Road close to where the cemetery is today. The proprietor was an army veterinary surgeon and the kennels provided temporary housing for the pets of army officers whilst on manoeuvres or engaged in the Boer War. In 1909 Eskimo dogs and puppies from Ernest Shackleton's Arctic Expedition were quarantined here. After the outbreak of the First World War the kennels rapidly filled and temporary shelter on adjoining land was acquired. In 1917 the kennels were permanently enlarged and refurbished with funds from the local branch of Our Dumb Friends League, which had been established in 1905 by residents of Blackheath and Charlton in order to raise funds for the rehabilitation of sick animals. They were evidently successful: a fair held at Woolwich Town Hall in December 1920 was opened by Princess Louise and raised £450 (worth £67,500 today). In 1919 a new lease on the premises had been acquired and in 1925 the League finally purchased the freehold and the site was enclosed with a fence. New kennel ranges were built, with large runs, and 180 dogs could be accommodated, with cats also catered for. The Ministry of Agriculture and Fisheries listed the Charlton Kennels among the recommended quarantine stations and during 1924 and 1925 over 770 dogs were quarantined and 2,300 dogs and 1,000 cats boarded. In 1925 a film about the kennels, now lost, was shown locally and led to sufficient funds being raised to establish an animal hospital in an adjacent house. In its first year over 250 animals underwent surgery. At the 1938 AGM of the League it was announced that the Winter Fayre would be opened by the well-known actress Fay Compton (1894- 1978) and that a Belvedere family had volunteered to finance an extension to the animal hospital, in order to provide staff rooms, an outpatients clinic and waiting room, and a full-time live-in veterinary surgeon. In that year among the notable dogs housed here were those belonging to the Emperor of Abyssinia and a canine recipient of the VC by the Daily Mirror. After the outbreak of the Second World War the kennels were fully occupied by dogs from the French and Belgian battlefields following the retreat at Dunkirk, and animals suffering mentally and physically as a result of the Blitz were cared for. The kennels and hospital were ably administered by a Miss Radley from 1939 to 1954, during which time the kennels were repaired and refurbished following war damage. In 1949 the League presented a new £1,000 ambulance, fully equipped with first aid equipment as well as baskets and cages. After Miss Radley's retirement, she was replaced as Superintendent by Mr Clarke, who remained until the hospital finally closed in late 1958, despite vigorous campaigning for its retention. The boarding and quarantine kennels had already closed in 1957 due to lessening use and the availability of cheaper facilities, either private kennels with fees paid by The Blue Cross or other Blue Cross kennels. From 1959 to 1972 the Blue Cross provided a mobile surgery, which called daily at a site behind Shooters Hill Police Station. The Blue Cross Animal Cemetery had been levelled in 1947 when its maintenance was no long financially viable. 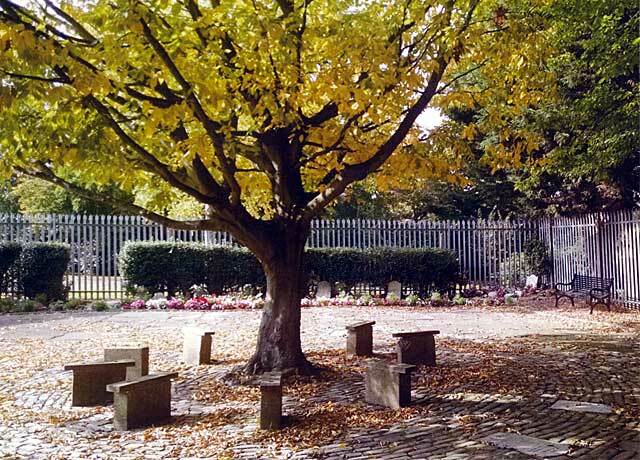 The tombstones were generally laid flat onto the ground to create a small memorial garden that had cobbled areas, with a couple of trees surrounded by seating, but it became neglected over the years. In October 2012 a group of local people, many of them dog walkers using the adjacent Hornfair Park, set up the Friends of the Pet Cemetery (FOPC) as a non-profit organisation to restore and maintain the now overgrown cemetery. Since then much work has taken place to replant the garden and the memorial stones are gradually being cleaned and restored. So far at least 240 gravestones have been discovered, some submerged under the earth; the earliest is dated 1908, the latest 1951, presumably commemorating animals who were not actually buried here. 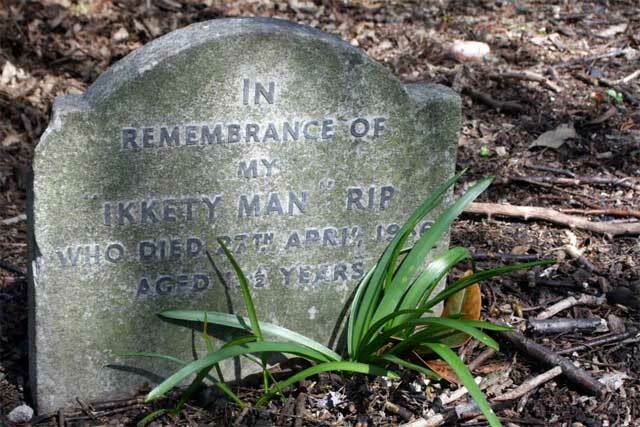 Many have touching inscriptions and give evidence of wartime service, and among the memorial stones is one commemorating a pet monkey. The Friends have been assisted by members of the community as well as local organisations, including Royal Greenwich Parks Department and Thompsons Garden Centre, which has led to donations of plants, benches, a water tap, bird and bat boxes, and a bug hotel made from recycled components. A grant from the Metropolitan Public Gardens Association enabled seating to be built around one of the trees. Regular site clean-up days take place, and there are plans for raised beds, new seating and other facilities. A memorial wall has been created and the first plaque, commemorating a long-lived cat called Polly, was unveiled in April 2015 by the Mayor of Greenwich. To date there are nine memorial plaques. For more information, please see the official Facebook page of the Friends of the Pet Cemetery.